Things don't look too good for Keiichiro. 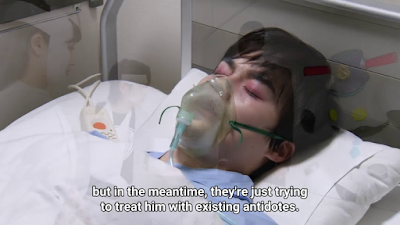 This is really very bad as le poison is working double-time in his body. Normally, beating le monster resets whatever the do -- all in the name of weird superhero logic. Meanwhile, Togeno begs for one more chance which would result to his fight to le death. Both Destra Majo and Togeno have a deal. Destra Majo shows off yet another power of le Lupin Collection for Togeno to use -- it doesn't look like good news! Meanwhile, there's a bit of shiptease between Umika and Sakuya. Is it me or do I like to shiptease them both? They feel like a Batman x Catwoman ship (which I'm not really that much of a fan of but still...) in some way. He goes somewhere because he's going to meet with someone. Meanwhile, Kairi meets with Tsukasa who looks pretty worried for Keiichiro. 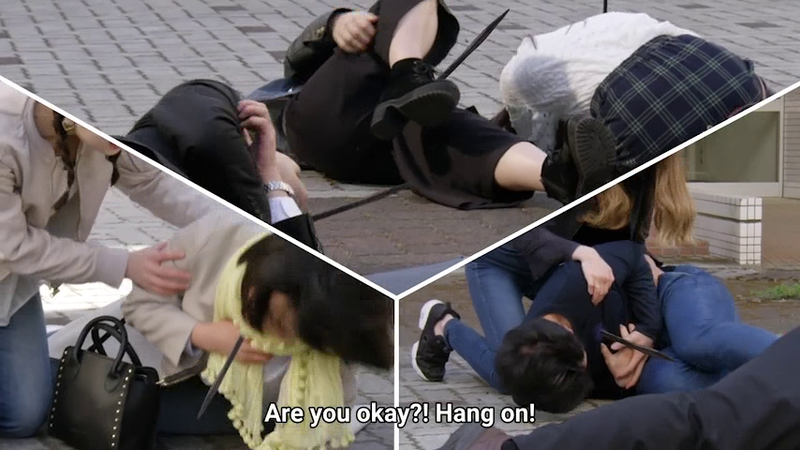 She reveals much of Keiichiro's fighting spirit one way or another. TBH, I just feel like that that Keiichiro should be a little more careful with what he does. 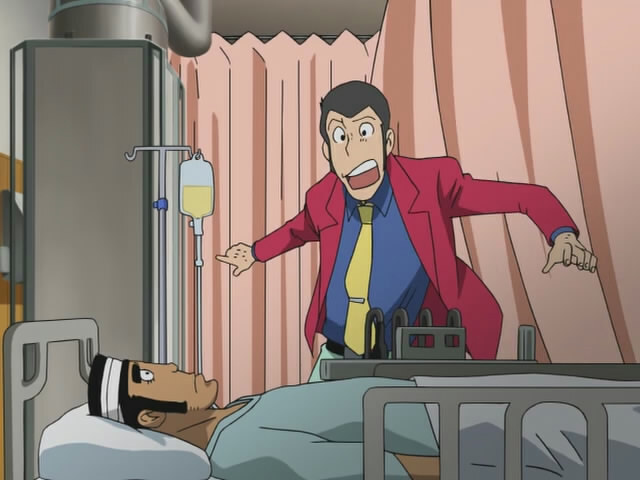 He doesn't have that same near invulnerability as Detective Zenigata would have in the Lupin III Anime. I kinda like this moment where Umika finds out that Sakuya is meeting some child. Yes, this one has le same child who admires the Phantom Thieves. I really love this detail as to how Sakuya decides to keep a promise. Bad news, Togeno shows up with himself powered up. Although it's not really that scary (visually speaking) but the thought of poisoned spikes HURTING and killing people is scary. He demonstrates himself powered up with the sniper ability. 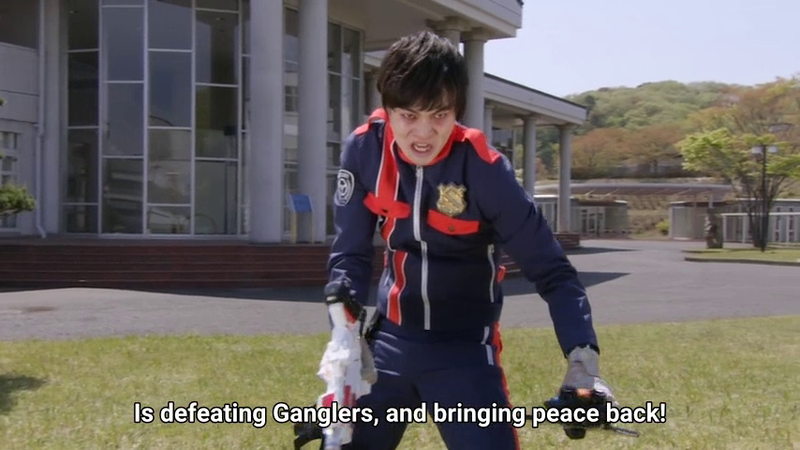 Le Lupinrangers are just too powerless against this guy! 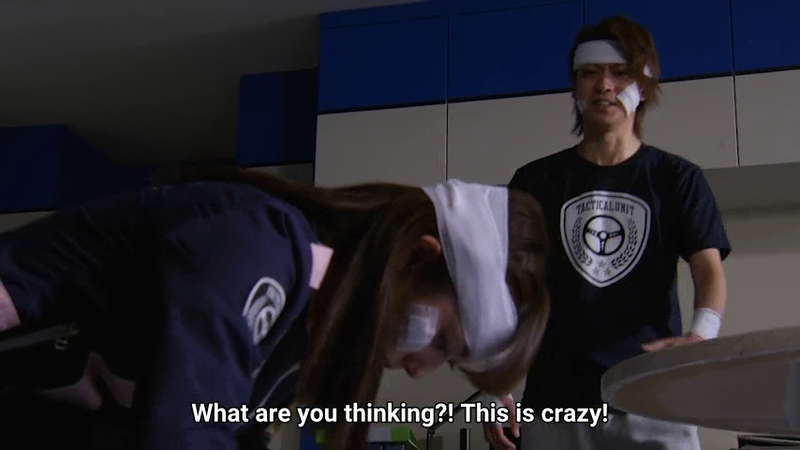 Meanwhile, both Sakuya and Tsukasa come up with a strategic plan. 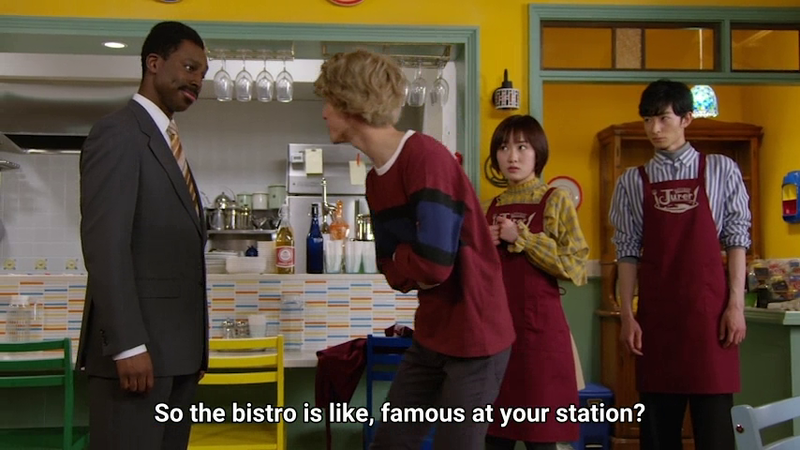 IMHO, I'm just reminded of that Boukenger episode where Sakura talks about proper strategy. 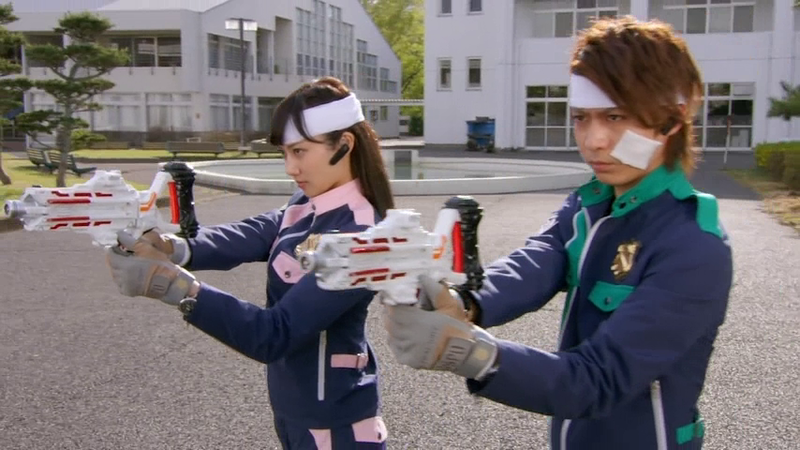 This is what Tsukasa is doing and it'd be a bad idea to mess up with her especially if she's the only one with a brain in her team. They come up with a plan to defeat le monster. Yes, Keiichiro shows up AND shows he's not easily beaten up. Sometimes, having an idiot in your team can be useful. Do you remember the Johnny English film? 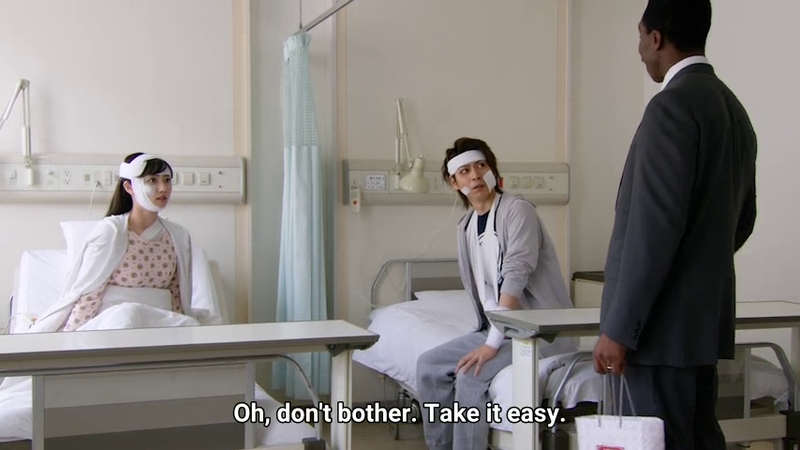 I kinda want to imagine Keiichiro is not only Detective Zenigata but also Johnny English. He seems to fear nothing because he knows nothing. 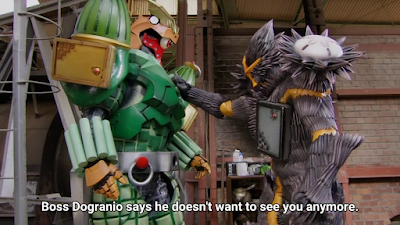 Not really, Keiichiro may be kinda stupid but he's smart in one area -- he always wants to get his duty fulfilled for others even at the cost of himself! 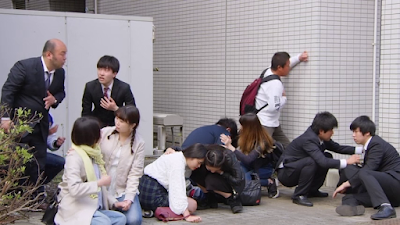 After le monster gets destroyed, le people are cured from their poisoning. So really, why do we have that kind of logic that after le monster of the week is destroyed that whatever effects they gave in all disappear? It's the nth time that this tool somewhat cuts slack in screen time. IMHO, I'd probably have them all admitted to a hospital and cured off-screen instead for a change. We have a new combination called Pat Kaiser Strong. 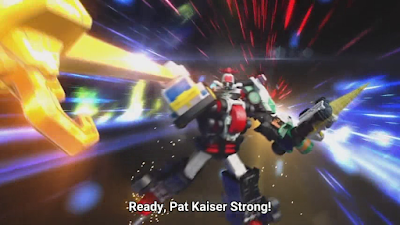 Le last week's Trigger Machine now combines with Pat Kaiser. Both le crane and drill work their charm to defeat an enlarged Togeno. It really looks cool with its CGI finisher attack. Drill and crane? 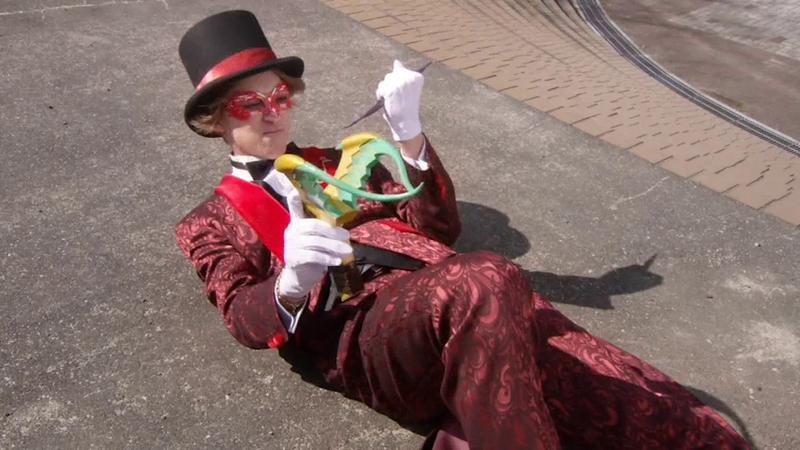 Hmmm that kinda reminds me of Boukenger but can't remember which episode. Still, it was amazing to see how le latest piece is two in one. Le both teams have some balance now. On le other hand, there's le problem where writers and producers may be trying to figure it out how to get le two teams together to destroy their common foe. Back to le kindergarten, I really still feel sorry for Keiichiro's lack of luck with children. Fortunately, he still smiles for Sakuya. 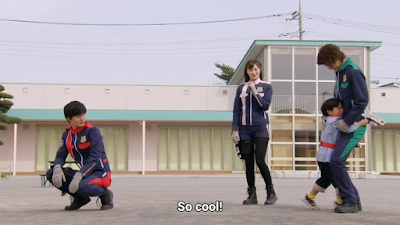 I thought that Keiichiro as dumb as he is -- he shows very heroic and noble qualities. Still, he needs a beating to help him become a better cop. 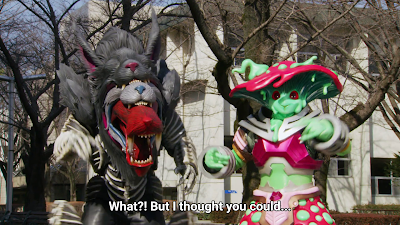 Next week, it's a monster and ranger body swap episode. Wait, didn't that also happen in Dekaranger where Hoji gets the same treatment? Hmmm... 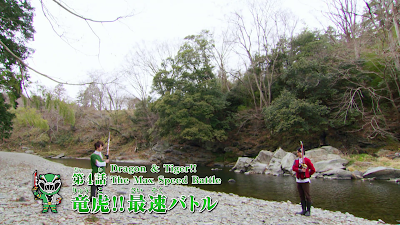 I guess we can't avoid Dekaranger references for le reason that we have le Patrangers as le secondary team, right? Adieu!